I have been called a nut, a fanatic, obsessed. Actually, I 'm merely a person with a mission. A friend once referred to it as my search for the holy grail (I think I like that one most.) But I do have to do it. To visit, photograph and document every standing lighthouse in North America. No easy task, considering the fact that I have catalogued more than 1100 so far. Means I will have to live long or retire early, or both. 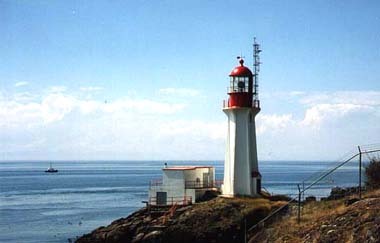 The Sheringham Lighthouse is located near Shirley on Vancouver Island, British Columbia. The photograph was made by good friends of mine, Paul and Shirley Vanderwood, and displayed here with their permission. Our vacation during July and August of 1997 took us, among other places to the coast of California, Oregon and Washington. The trip included visits to eighteen lighthouses. I made some 400 photographs of lighthouses on the trip. Our vacation during the summer of 1998 took us to Newfoundland, Nova Scotia, New Brunswick and Prince Edward Island and included visits to 64 lighthouses. Photographs of almost all of those lighthouse are now on this site. Visit them by going to my Canadian Lighthouses page. 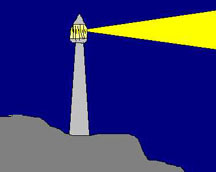 I have a lighthouse club on Yahoo Clubs. Why don't you drop in for a visit and if you like it, join. My sources of information and pleasure.